Luxury skincare brand Lubatti have released their latest skincare product in the form of Anti-age Wonderlip which has been specifically designed to help increase lip volume whilst reducing fine lines and wrinkles. I was sent a tube a few weeks ago and have been putting it through its paces thanks to the recent cold snap. The tiny 10ml tube is filled with a deliciously-light, gently scented balm that promises to nourish lips whilst providing a plumped up pout with less of those pesky fine lines and lip wrinkles. First things first, it works… really, really well but not in the stinging, lip-irritating way that lip volumisers usually plump. This is a silicone-heavy lip primer that fills the furrows and smoothes the lip texture, creating the illusion of a prettier pout. That’s not to say that there are no long-term skincare benefits to help promote lip volume, but first and foremost – think of this as a non-drying lip primer. And the term non-drying is key here, as most lip primers I’ve tried in the past leave my lips looking good but feeling tight. 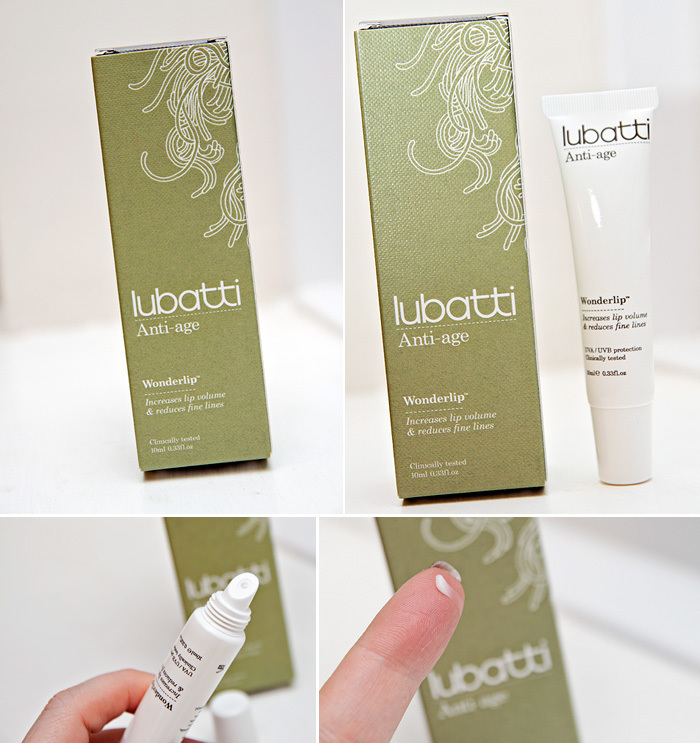 The Lubatti Anti-age Wonderlip* manages to prime without any unwanted side-effects. Except for one. A great, big dent in your wallet. Priced at £29, it’s a costly addition to your skincare routine but seeing as it offers a tangible difference – I have visions of this becoming a bit of a cult product among those who can afford such luxuries. If you suffer from dry lips, I think you’ll probably still need the support of something a little more heavy duty on the moisturisation front and paired with a nightly application of Lanolips 101, this has become a bit of a dream team lip-combo. Not one that I can afford to sustain… but it’s very, very lovely while it lasts. Ingredients: Dimethicone Crosspolymer, Isododecane, Cera Alba, Cyclopentasiloxane, Dimethiconol, Aluminium Starch Octenylsuccinate, C 18-21 Alkane, Vp/hexadecene Copolymer, Ethylhexyl Methoxycinnamate, Tribehenin, Ethylhexyl Palmitate, Sodium Hyaluronate, Palmitoyl Oligopeptide, Ethylene/Acrylic Acid Copolymer, Butyl Methoxydibenzoylmethane, Silica Dimethyl Silylate, Aroma, Sorbitan Isostearate, Butylene Glycol, Tocopheryl Nicotinate, Phenoxyethanol, Hexylene Glycol. I’ve been using Balance Me’s Rose Otto lipsalve, and it’s just lovely, I’d recommend & only £8.00. Only need a tiny bit too! My sister recommended this the other day and it’s amazing – it’s got a really subtle smell that’s so moreish. I’ve got really dry lips and it’s been excellent for that too.